Pure coconut flavor. Easy to make. Mix everything together and place the saucepan in a frying pan filled with simmering, not boiling, water. Using a wooden spoon, stir the mixture until the egg whites have thickened slightly and become opaque. Remove from the heat and let sit 30 minutes. Meanwhile, preheat the oven to 350 F.
Line cookie sheets with parchment paper. Form macaroons, using 2 TBL of batter and placing them about 2 inches apart. Bake for 5 minutes, until the tips begin to color. If you don’t have a convection setting on your oven, you may want to rotate the trays and shift the top and bottom pans midway through cooking. Lower temperature to 325 F and back for until they have color all over and the edges are starting to brown — about 10 to 15 minutes. If they’re cooking too fast at the tips, you can lower the heat to 300 F or try putting a sheet of foil over the top (just set it on loosely). 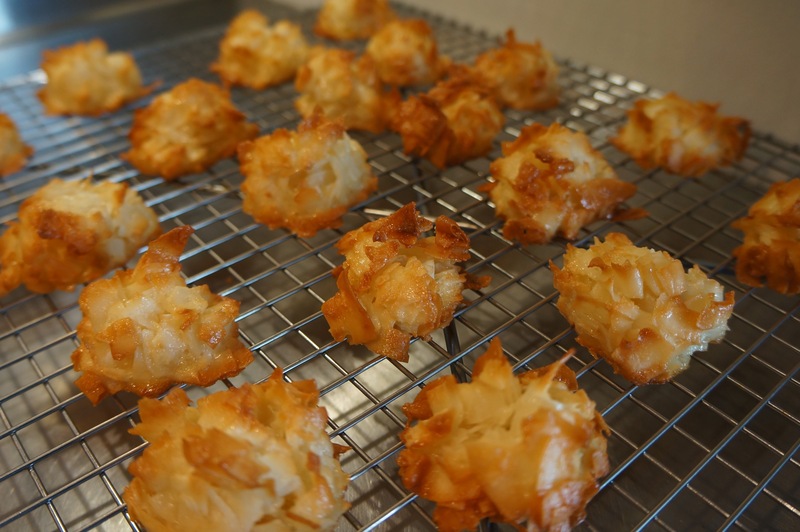 Remove from oven and let cool before peeling away from the macaroons. While these keep for 4 days, they are &diamondsuit;ATTN notably better on the day they are baked, especially if you live in a humid area. NOTE: I suspect &diamondsuit;ATTN artificial vanilla that is clear would work better because the coconut won’t get tinted by the vanilla, resulting in cookies that are golden on the outside and pure white inside. Nonetheless I use natural vanilla extract and no one has complained.